In our introduction, we hinted that this may be the very last issue of The Journal of Unlikely Entomology. Sadly, economics forces our hand. This is partly due to the nature of the (post)modern world, which both enabled us to create this peculiar and sublime thing, while nearly guaranteeing that it could never pay for itself. And it’s partly due to my failure to dedicate the time needed to turn this humble ‘zine into a revenue-generating thing. The reality of the situation is that we have funding that will last us through Summer of 2015. 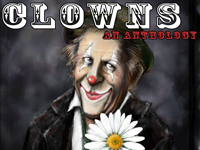 We will still be publishing The Journal of Unlikely Cryptography (Issue 11) in early February, The Journal of Unlikely Coulrophobia (Issue 11.5) on April Fool’s Day, and The Journal of Unlikely Academia in June or July. After that things become a bit hazy. One option is to revert back to a scale that I can pay out-of pocket: two issues per year and a pay rate of $.01/word. It’s not an appealing option. Another option is to announce that we had a good run, and thanks for all the fish. Also not an appealing option, sushi notwithstanding. There are other options, and we’ll be exploring them in some depth as time ticks away. I am confident that Unlikely Story will continue to bring you strange and wondrous tales, but I am equally confident that it shall take on a new form. We look forward to seeing what emerges from the chrysalis.